Tyre racking can be supplied as low level hand loaded tyre racks in both single and double sided options that give easy access to tyres stored on adjustable storage levels. This tyre storage system is ideal for storage of tyres and wheel rims adjacent to the working area. 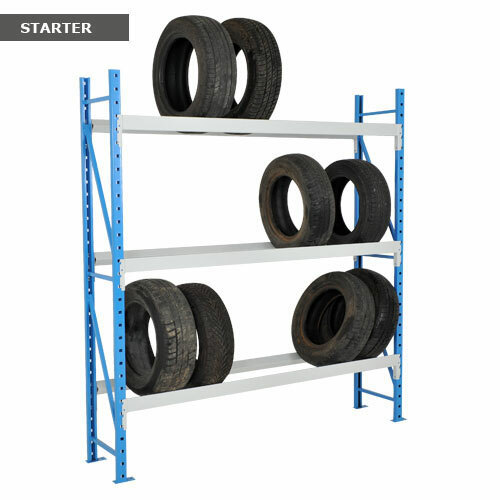 The easy assembled shelving can quickly be built into tyre racking storage bays. Single and double depth racking. For the storage of tyres and wheels where easy access is required. Hand loaded tyre racks in single and double sided versions. Ideal economical heavy duty tyre & wheel storage units for the motor and garage trade. Simple and cost effective tyre storage for the smallest garage to the largest tyre distributor.